Samsung has made no bones about its ambitious plans to launch an entire range of folding smartphones, starting with the so-called Galaxy X early next year. However, Samsung has so far failed to reveal exactly what form these bendy blowers will take – whether its folding handsets will always have the book-like hinge design revealed on-stage during its most recent developer conference, or whether the company has something entirely new planned for future devices. Well, it seems we now have our answer. New patents from Samsung reveal some ambitious new designs for future folding handsets from the company, including a clamshell-like device that opens like a pocket mirror. The previously-unseen design, which was filed with the United States Patent and Trademark Office (USPTO) and unearthed by Let's Go Digital, shows a handset with an extremely tall display when completely unfurled. Unlike the Galaxy X briefly demoed on-stage during the developer conference, the display has a horizontal fold across its mid-point. When previewing its first folding handset, Samsung said the advantage was the ability to increase the available screen real estate to read ebooks, watch movies and run multiple apps side-by-side. However, it's unclear exactly what the advantage of this new patented design would be, given that the resulting screen is so thin. Granted, it looks ideal for watching widescreen format video on-the-go without having to deal with the infuriating black bars that accompany movie viewings on every other handset, but that's a fairly limited use case. Whereas the ability to scroll through immeasurably long Facebook and Twitter timelines doesn't sound like a compelling reason to get customers to upgrade their existing handset to this all-new clamshell-folding design. However, it's undoubtedly an interesting idea and shows that Samsung is experimenting with some new form factors when planning its new Galaxy X folding smartphone range. 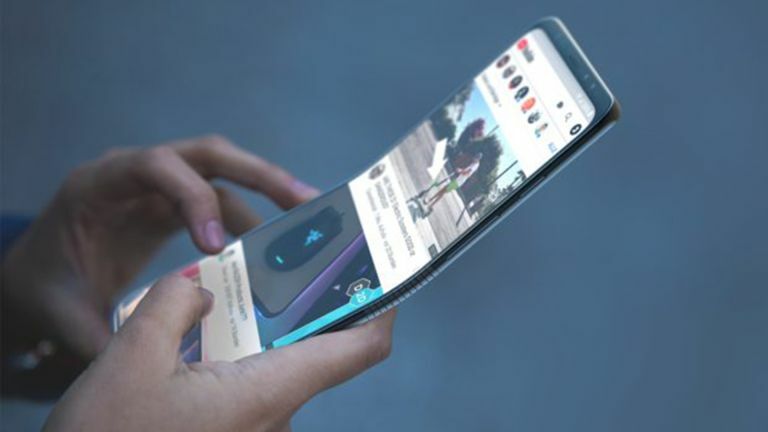 This is not the first time we've seen evidence that Samsung is looking into the possibility of launching a smartphone that folds lengthways. Previous patents suggested the Galaxy X might have a similar form factor, although this failed to materialise during the keynote presentation earlier this month. Instead, the Galaxy X revealed on-stage opened like a paperback, with a smaller, unfoldable OLED on the front of the device, which Samsung refers to as the Cover Display. This allows smartphone owners to interact with the device without the need to unfurl the foldable 7.3-inch OLED display each time. Elsewhere, Samsung is also looking into the possibility of folding tablets to join its Galaxy X smartphone range. Like the latter, these devices will allow owners to transport large displays in devices with a physical footprint that remains small enough to carry in a backpack, or take onto a plane. Samsung is widely-tipped to unveil more details about its burgeoning folding gadget range during CES 2019 in early January, so stay tuned for more details.